Squeezed between the ocean and the rugged Coast Mountains, the Pacific Rim and the rest of North America, Vancouver's attractions range from the thrilling to the tranquil and cross many cultures. It's always a good idea to get an overview before you jump into something new, and the best place to do that in Vancouver is from the top of Grouse Mountain's Observatory Restaurant. Perched more than 1,000 metres above the city, dinner begins with a tram ride from the bottom of the mountain into the alpine of one of the three ski hills on Vancouver's North Shore. Crossing the 430-foot, Indiana Jones-style swinging bridge will only take a few minutes – plus a few more to ogle at the Capilano River 230-feet below – but you can easily kill a couple hours here with the other attractions: a canopy walk through old growth firs and cedars, interpretive paths through the forest, an airy glass walkway and historical displays. Deservedly, Vancouver is known for its inexpensive, high quality sushi, and no visit is complete without sampling some. Head over the Lion's Gate Bridge, with its beautiful harbour views, to downtown. You can't go too far wrong anywhere, but one of the best sushi places is centrally located Shuraku on walking-only Granville Street. Browse the halls of the historic Vancouver Art Gallery, only a few blocks from Shuraku. Wander down Robson Street to people-watch and shop on Vancouver's Rodeo Drive. 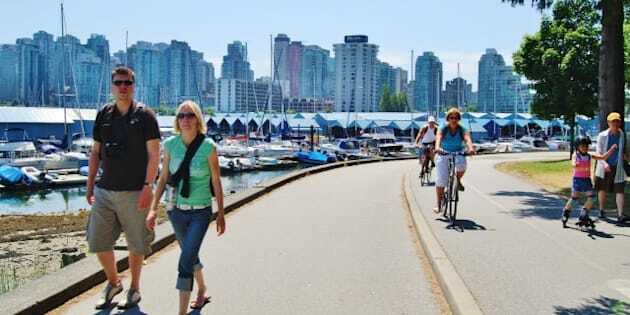 Walk, run or ride around Stanley Park's seawall. The full loop around the 400 hectare national historic site (it was opened in 1888) is 8 km – about a one-hour run, two-hour walk or 45-minute bike ride. Several companies rent bikes near the downtown entrance to the park, like Spokes Bicycle Rentals. The greater Vancouver area is home to 2.5-million ethnic Chinese, about 17 percent of the population. So, no surprise, Vancouver's Chinatown is one of the largest in North America, located just to the east of the downtown core. Options for standard Chinese food abound, but for something unique, try Bao Bei, a Chinese take on the tapas bar, serving plates with Taiwanese and Sichuan influences.